We sing hymns Father and ask for your grace. 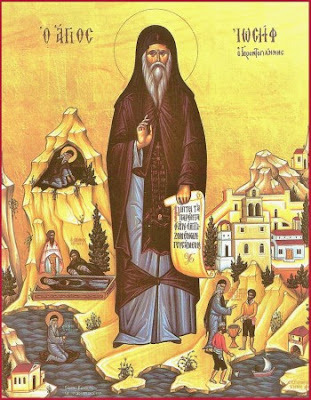 On August 6, 1874 Saint Joseph Gerontogiannis, abbot of Kapsa Monastery in southeast Crete, invited the brotherhood back to his cell to ask their forgiveness, and received Holy Communion. He did the sign of the cross, turned right, and crossing his arms he delivered his venerable soul into the hands of the transfigured Lord. For three days his body was unburied and was a means of popular pilgrimage for the faithful to say their final greetings and venerate him. He was buried in the Church of the Honorable Forerunner, where many continued to come and venerate his relics and icon and take dirt from his grave. The translation of his relics took place on May 7, 1982, which was 108 years after his repose, and it is celebrated annually on Bright Tuesday, along with his primary feast day on August 7th. The sacred relics were placed in a silver casket with his honorable skull in a prominent place of the church and they give off an unspeakable fragrance. Monk Gerasimos Mikragiannanitis wrote a Service in his honor, and it was published with his Life by Kapsa Monastery in 1993. He was officially canonized by the Ecumenical Patriarchate in 2004. Your revered relic we celebrate in a sacred manner, Joseph the God-bearer, which being carried forth from your grave, we are filled with a spiritual fragrance, and richly with grace through it, divinely giving what you truly supply, to the faithful who cry out: Glory to Him Who gave you strength, glory to Him Who crowned you, glory to Him Who works through you all manner of healings. You lived like an angel in Kapsa, being made worthy of the good repute of the Angels, while we gather around the container of your divine relics crying out: Joseph you are our boast. The divine vessel of your relic, sanctifies the faith of those who reverently fall before them, thrice-blessed Joseph, for you deliver us from all need, illness and danger.